Abu Dhabi, UAE – 11 March, 2019: The International Fund for Houbara Conservation (IFHC), the global leader in proactive species conservation, will roll-out a series of interactive experiential learning activities at the forthcoming Mother of the National 2019, which runs 12-23 March on Abu Dhabi Corniche. Aimed at engaging UAE school students in the importance of conserving and protecting the vulnerable bustard, the Fund's Mother of the Nation activities are designed to foster increased education and awareness of its efforts to increase wild populations of the houbara species across its range of natural habitats. Themed ‘Speed Up Experiential Learning', the Fund's tailored activity schedule during the 12-day event - which celebrates and honours the inspirational values of Her Highness Sheikha Fatima bint Mubarak – will feature a series of interactive games, competitions, puppet shows and a Virtual Reality experience. The activity schedule includes the Houbara Floor Game, where children can roll a giant-size dice on a specially-designed board with every move educating players on key houbara lessons, while a bustard-themed puppet theatre show - Embracing the Houbara - will entertain little ones on the March 12 and 20. 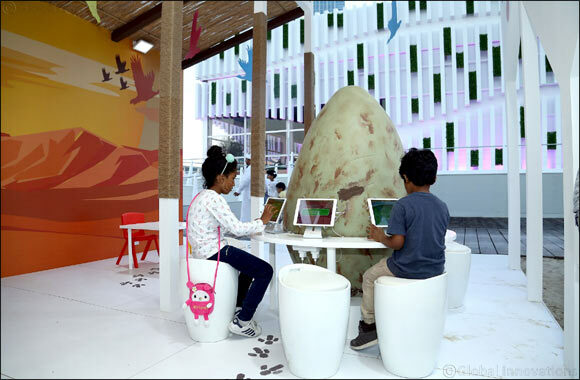 The Migration Globe & iPad games will teach children about houbara migration routes and range countries, mating seasons and dietary issues, while a Virtual Reality (VR) activity will showcase short movies on the houbara as well as IFHC conservation initiatives. Mother of the Nation visitors will also be able to get up-close to and interact with live houbara in a special display area, where specialists will divulge first-hand information and facts. “Our objective at the Mother of the Nation 2019 is to continue educating and spreading awareness about houbara conservation through our experiential learning programme. We firmly believe that learning through active participation, as well as interacting with live houbara, is a fun and effective way of raising awareness on the conservation of this emblematic species,” said Noor Al Marzouqi, IFHC's Deputy Director General. In addition to the experiential learning activities, IFHC is launching a bookmark competition for school students. The Make Your Mark school competition asks students to select a fact or statistic about the species and then design a bookmark that visualises their understanding of the species and its natural habitats. Children can make their mark ahead of Mother of the Nation and submit them to IFHC at the event for a chance to win an iPad. IFHC's education programme piloted in seven Abu Dhabi schools in 2018 in co-operation with the Ministry of Education (MoE) and Abu Dhabi Department of Education and Knowledge (ADEK). The programme is currently engaging 37 schools across the UAE.